Pregnancy & Lactation Formula from BioCare provides the essential nutrients required during pregnancy and while breastfeeding. The formula includes folic acid at the recommended levels along with vitamin B12, Iron and Zinc. 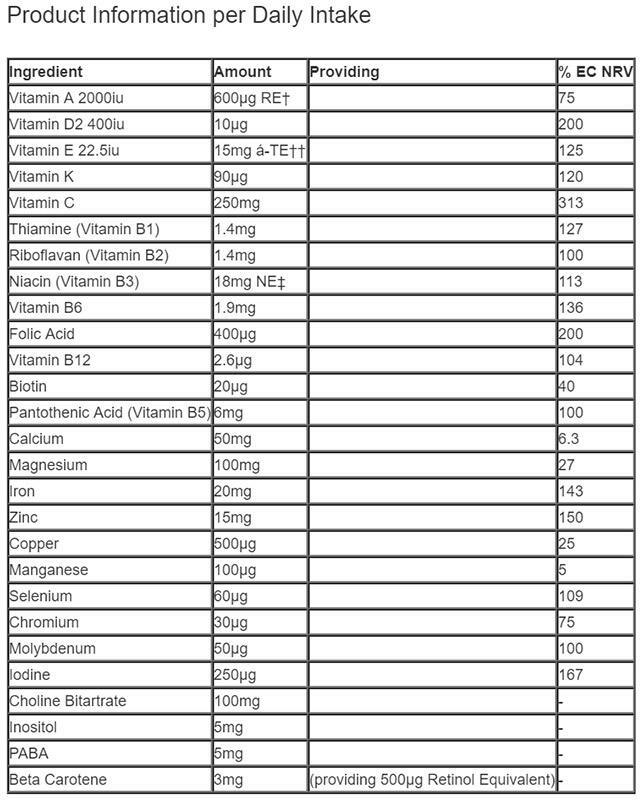 Pregnancy & Lactation Formula contains vitamin A. This pack contains 60 capsules which provides 30 days supply. The Department of Health recommends that women who could become pregnant or who are already pregnant take Folic Acid daily at 400 micrograms -- before conception and throughout the first 12 weeks of pregnancy. Magnesium Citrate, Vitamin C (as Magnesium Ascorbate), Calcium Citrate, Capsule Shell (Hydroxypropyl Methylcellulose), Choline Bitartrate, Iron Citrate, Zinc Citrate,, Vitamin E (as D-Alpha Tocopheryl Acetate), Corn Starch, Niacin (as Nicotinamide), Anti-caking Agents (Magnesium Stearate & Silicon Dioxide),Dicalcium Phosphate, Silicon Dioxide,, Olive Oil, Modified Tapioca Starch, Pantothenic Acid (as Calcium Pantothenate), Microcrystalline Cellulose, Inositol, PABA (Para Amnio Benzoic Acid), Acacia Gum, Copper Gluconate,, Beta Carotene, Vitamin B6 (as Pyridoxine Hydrochloride), Sunflower Oil, Thiamine (as Thiamine Hydrochloride), Riboflavin, Sucrose, Vitamin A (as Retinyl Palmitate), Manganese Citrate,, Folic Acid, Chromium Picolinate, Antioxidants (Ascorbic Acid, Ascorbyl Palmitate & Natural Mixed Tocopherols), Potassium Iodide, Vitamin K1 (as Phylloquinone), L-Selenomethionine,, Sodium Molybdate, Biotin, Vitamin D2 (as Ergocalciferol), Vitamin B12 (as Hydroxycobalamin).